Proinnsías Ó Duinn was born in Dublin Ireland. He studied ‘cello, piano and orchestration privately and at the Royal Irish Academy of Music and the College of Music in Dublin. His first professional conducting engagement was at the age of sixteen. Two years later he was appointed Music Director of the Gaiety Theatre and the following year was invited to conduct the RTE Symphony Orchestra (now called the National Symphony Orchestra of Ireland). He still maintains a close relationship with them. 1965 appointed Principal Conductor of the Orquesta Sinfonica Nacional del Ecuador. (Irish Times 1971 Mahler No 1) "Quite clearly, Mr Ó Duinn had authority. He knew what he was doing and knew what he wanted - and got it with clarity and no fuss. He had the air of being willing to, and knowing that he could, trust his players as artists without unnecessary and annoying gestures"
(Irish Times 1973 Sibelius No 2) "Proinnsías Ó Duinn has of course a rather special understanding of strings: he can mould phrases so that the speed fits the players' breathing and bow length like a glove; this knack or skill makes it very rewarding and satisfying to play with and for him. Add to that the ability to play a romantic work such as the Sibelius with such musical feeling that one wanted to sing the tuine with him"
1974 appointed Vocal Advisor to the Irish Radio and Conductor of their Chamber Choir. Two years later he received the Radio and Television critics’ prize for “the quality of his work and his inventive approach to programming”. 1984 founder Director and first Music Director of Opera Theatre Company in Ireland. 1986 Appointed to Board of Directors of Cork City Opera. 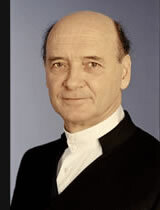 (Irish Times 1990 Bruckner No 9) "He is still one of the most inspirational conductors working regularly with any Irish orchestra"
2003 became the first Conductor Laureate ever appointed in the history of the Irish Radio/Television. During his tenure with the orchestra Ó Duinn was the prime mover in them becoming one of the most versatile orchestras of its kind in Europe, with a vast repertoire covering almost every genre. He toured extensively with his orchestra throughout Ireland, Great Britain and the United States and has recorded with them on Marco Polo and Naxos, among others. During this period he has conducted and recorded many National and World Premieres in repertoire as diverse as the music of Bill Whelan (River Dance and Seville Suite) to the symphonies of John Kinsella. Apart from his conducting career, Proinnsías is also known as a composer and orchestrator. His musical Stuff & Nonsense (based on the life of Edward Lear) was premiered in 2001. The seven hour TV drama Strumpet City, for which he composed and conducted the soundtrack, was heard again in 2005 when it was released in DVD after successful international TV acclaim. He has composed for Orchestra, Chamber Music, Theatre and TV.